Park soccer, social cricket and street basketball bring the public spaces of our cities to life. For many of the most marginalised communities, access to public space for sport is crucial for developing and maintaining a sense of belonging. But as populations grow and competition for playing fields, courts and parks becomes fiercer, many communities are losing access to their sporting spaces. Our research project is exploring informal team sport, social inclusion and urban space in Sydney and two other cities, Singapore and London. We are focusing on “pick-up sport” – regular or semi-regular team sports played in public spaces where people join in on a “turn up and play” basis. 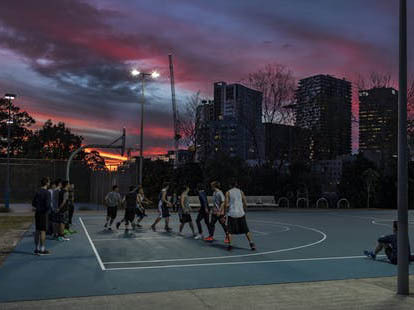 On Friday nights in Sydney’s Blacktown, people of all ages from Filipino and African backgrounds play basketball in neighbourhood stadiums and public courts. In Redfern, Aboriginal youth play street ball on outdoor playgrounds in a rapidly gentrifying neighbourhood. Ashfield Park in Sydney’s inner west comes alive in the late afternoons as Sudanese, Nepalese, Indian, Chinese, Afghan, Iranian and Turkish people gather for park soccer. On Friday nights, a group of Colombian men play against Chileans. Both groups wear homemade team jerseys. On Sunday afternoons in summer the informal Sydney Nepalese Soccer Club uses the park to train. Later in the evening, men from Nepal and India play social cricket. These games have histories. Many of the players have gathered weekly for years. In some cases, informal teams have evolved into official ethnic leagues. For new arrivals, getting involved in pick-up sport can be an important first step into the friendships and social networks that help a newcomer with settlement, integration and belonging. Structured sport programs are often used to increase community cohesion and assist migrant settlement. However, many marginalised city inhabitants prefer informal sport to official club sport. Registration costs, language barriers and stigmatisation of racial minorities – including Aboriginal youth – make joining an official club difficult. For transient groups, like temporary migrants, the constraints of organised club sport are prohibitive. And, of course, women face a number of barriers to participating in sport. For many, just finding and registering for a formal neighbourhood team is a leap into the unknown. Pick-up sport, on the other hand, allows for relaxed rhythms of encounter. These unhurried interactions allow space for the “slow cook” that is needed for new forms of community and “multicultural conviviality” to emerge. Interactions across ethnic and socioeconomic lines, and between newly arrived and longer-term residents, help city communities to thrive. Pick-up sport provides the perfect opportunity for this. But this social activity is increasingly under threat. The threat is palpable for one group of migrant and refugee men we have been observing in Sydney’s inner west. They have been playing social soccer in the same park for over a decade. The players come from Afro-Caribbean, Chinese, Afghan, Iranian, Turkish, Nepalese and South American backgrounds. They are a mixture of longer-time immigrants and relative newcomers, including refugees and international students, with ages ranging from early 20s to 60s. The group is always evolving as people come and go. For these men, playing soccer gives them a real sense of community and belonging. It also cultivates an openness to meeting new people who regularly join in. Their games have run through summer, while official club games run over winter. Traditionally, this sporting ground has been happily shared between the formal and informal teams. However, the council has recently started renting the fields for private summer competitions and training, ending its support for “time share” between paid and unpaid use. The group of men were reportedly politely told “sorry you can’t play here” and that the clubs were paying, had booked the space, and thus had a “right” to it. The team has since been forced to play on sloping bumpy ground among the trees. These displaced players feel angry, marginalised and discriminated against. Their long-term use of the space was not recognised, nor was the social value their activity brings to the area. This story is repeated around Sydney and across the country as sporting clubs compete for space and increasingly cash-strapped local councils look for ways to increase revenue. We met a social soccer team of young Muslim girls who were displaced because, they were told, the council needed funds from paying club sport to maintain the fields. Meanwhile the New South Wales state government is pushing ahead with plans to spend over $2 billion on two major Sydney stadiums, despite considerable community backlash. These commercialising forces ultimately undermine the social benefits of both formal and informal sport and the inclusivity of cities. Beyond sport, these instances raise important questions about urban planning, gentrification and the privatisation of public space. These forces have real consequences for the formation of new communities and integration in diverse cities. As the sociologist Iris Marion Young argues in her book, Justice and the Politics of Difference, public space is where the city’s strangers come together. Sport can produce great community benefits. We urge planners and politicians to consider the important role that open spaces have for informal social team sport in enhancing community cohesion in our big cities.